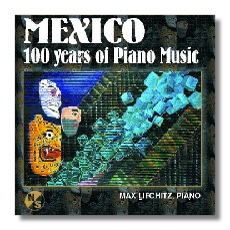 Not all that surprisingly, the development of modern Mexican nationalist music has followed the route of Spain, beginning with Chopin grafted to native melodies, moving through a "French" Impressionistic phase, and finally developing a modern voice in which native elements become distanced and "objectified," not unlike the Russian elements in Stravinsky. Of course, the presence of Chavez and Revueltas, geniuses largely self-taught, didn't hurt. Unfortunately, the music chosen for the program mostly bounces between the charming and quite forgettable and the file-cabinet gray "international" contemporary style of Enriquez and Lavista. One could put together a nice disc just on music by Chavez, Moncayo, and Halffter, or, for that matter, just by Chavez. At least here, the impressionist "… de rosa en rosa…" and "Adelita" would allow a listener to see where Chavez came from. Here, they get lost among the bon-bons and the drones of High Seriousness. Lifchitz treats every piece well, despite an occasional tendency to overpedal (some of the fast runs wash out), but I consider his programming error just about unrecoverable. The one work that really grabs the listener immediately is Chavez's Sonatina, a piece that, despite its brevity, becomes monumental in effect. The danger here is that the pianist will force things, that every passage stays at the same loud dynamic, but Lifchitz knows to vary the line and to keep the counterpoint clearly heard.